Book by 31 March to get 10 mpd on Agoda, Expedia, and UOB Travel. The UOB PRVI Miles card normally offers 1.4 mpd on local spending, 2.4 mpd on overseas spending and 6 mpd for spending on selected OTAs. UOB has just launched a new promotion that could be potentially useful for those of you locking in travel plans by 31 March 2019. You can earn 10 mpd when you make hotel or airline bookings on Agoda, Expedia, UOB Travel and Kaligo with your UOB PRVI Miles card. UOB PRVI Miles has consistently offered 10 mpd for hotel bookings made through Kaligo. This has once again been extended till the end of the year. Kaligo is a great OTA to use…if you’re sure the rate you see is competitive with those offered by other websites. My experience with Kaligo is that rooms tend to price at higher rates compared to elsewhere, but of course if you find an equivalent or lower rate on Kaligo, it’s a no brainer to book through them. 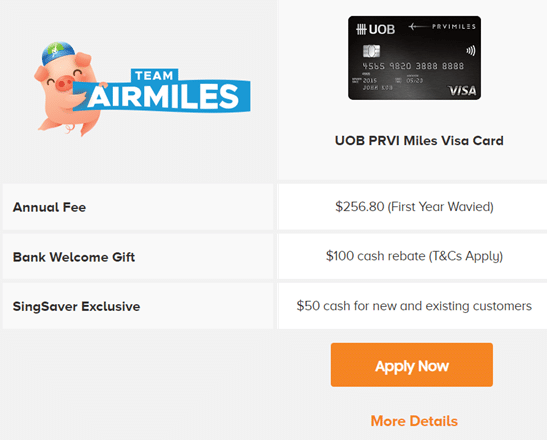 As part of the ongoing SingSaver January deals, new and existing UOB cardholders who sign up for a UOB PRVI Miles Visa (note: only the Visa version of the card is available under this offer) will get $50 cash upon approval. This is valid for applications submitted by 31 January 2019. Do remember the ongoing miles vs cashback contest- this lets you win up to $888 of cash when you post why you’re a miles user. If you’re a new-to-bank customer, you may also be eligible for a $100 cash credit if you’re within the first 200 cardholders to spend $1,000 within 30 days of approval. This promotion started back on 1 Jan 19 and runs till 23 Jan 19, and you want to take that into consideration when factoring in your odds. So long as you’re aware of the T&C, this could be a fantastic opportunity for you to chalk up more UNI$. UOB partners with both KrisFlyer and Asia Miles, so you have options of where to transfer those points. Does Expedia and UOB travel share the same cap or are they separate? i.e. will I get 10mpd for 3k SGD spend on Expedia and 10mpd for another 3k spend on UOB travel? Would love to know too. Thanks Aaron! Called the hotline. It is separate cap. So can book air ticket from expedia or uob travel planner and then book hotel from agoda. Good deal! So if one has all 3 prvi cards amex visa and mc, does that translate to a 3k cap per card? the cap is per card account, so yes. Are they blocking premium economy flights from this offer or is it just a system error? Hi, just wanna check and confirm, for Agoda, I booked through the landing site as required. Then there’s a click where I can choose to accept Agoda$ rebate which will be credited to my Agoda account 7 days after check out. I notice in UOB’s T&C, it mentioned something about 10mpd not in conjunction with some other promotion, etc. Will this affect my miles earning from this promotion? I don’t think it would, but just wanna be careful. Thanks! i think u can! i just got my agoda$. woohoo! Tix on UOB Travel always seems to be more expensive than on other OTA or airline site. Eg. SIN-LHR SGD1,332.40 on UOB Travel vs SGD991 on Skyscanner vs SGD 1,152.80 on BA site. Is the fare difference worth the additional miles?